Development of the SSCC (Serial Shipping Container Code) is combined with the introduction of supply in the electronic delivery note is still very actual for several hundred suppliers to retail chains because it motivates the interest of business partners such as MAKRO Cash & Carry or AHOLD. 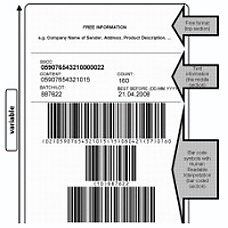 Companies encourage their suppliers to the labeling logistic units (mostly pallets) by the SSCC codes. They are sent as part of EDI messages DESADV. During receiving the goods it is taken over the whole pallet at once intact and its content is being loaded from an electronic delivery note (DESADV) by SSCC code. These giants allow their suppliers significantly accelerate delivery of products by this and also improve its traceability in the supply chain. Suppliers will be able to achieve acceleration of deliveries of these distribution centers. Utilization of the code entered in the SSCC bar code usually type of GS1-128 (formerly EAN-128), which can sensor simply load and it can significantly accelerate and facilitate the reception of goods and improve its traceability. Our company is a system integrator and we can provide you software for creating SSCC labels as well as labels for these printers and applicators for their location. Check out our case studies and contact us !